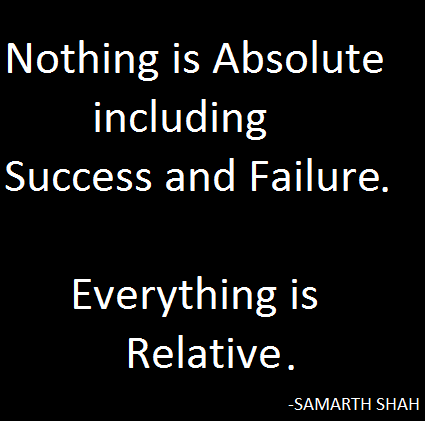 We all have heard of Einstein’s “Theory of Relativity” but this post is about realtivity in our life. When we were small , we were happy with small things and our thought is confined within our small community. If we get higher marks or even beat someone in cricket match , we were more than happy and it is “Success” for us. But as we grow we came to know about facts of life. And relativity is one of them. As we grow we come to know that what we were considering as a Success is a realative success to our specific community. When I thought more about it, I realized nothing is absolute in this world. Everything is relative. When you got admission into school, you were happy because you got into better school than your friends. In this case your success is relative to your friends. It applies in each and every case including Job, Promotion , Money etc. You can just make list of the things that you are proud of . Then try to find people who are best in related field you have listed. I am sure you can find many people who are more successful in the related field. You might ask “Okay. Agree we live in realtive world and my success is relative to my community but what about the best person in relative field”. The simple answer “He might be the best person in the relative field but he might not have the things you have. To give you an example Stephen Hawking is world’s renowned scientist/physicist. He has great mind but he has to rely on other people to do even his daily tasks.” This example is just to give you an insight into my defination of relativity. Similarly it applies to failures and human emotions. Posted in Food For Life and tagged childhood, community, einstein, Emotions, example, Failure, failures, food, food for soul, human, job, Learn, Life, promotion, relativity, scientist, small, soul, Stephen Hawking, Success, task. Bookmark the permalink. When you change the way you look at things, the things you look at change.